I’m going to let you in on a secret: my daughter LOVES to squeeze the glue bottle, usually using way too much glue for whatever she is doing. 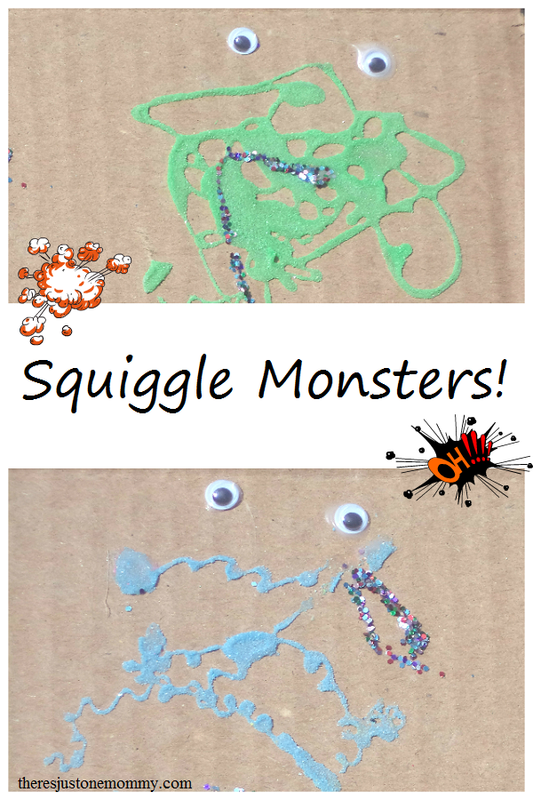 These fun Squiggle Monsters let them squeeze that glue bottle ’till their heart’s content! To start with, cut your cardboard into large square or rectangular pieces. This will be your canvass. Cardboard provides a much stronger canvass for your masterpiece than regular paper. Once your cardboard is ready, it’s time to get creative! Give each child a bottle of glue and let them squeeze it into a squiggly shape. Once they are happy with the results, it’s time to add the colored sand. If you have a large bottle of sand, you may want to put a small amount into a dish or a plastic salt shaker to eliminate a big mess. Make sure the glue is completely covered with sand. We usually shake the excess sand off into a separate dish so we can add it back to our sand container when finished. If you are working outside and don’t mind losing a bit of sand, you can just tap the extra off into the grass. Once your monster’s body is complete, it’s time to add googly eyes. You can also use a bit more glue to add a mouth or other details with a different colored sand or glitter. 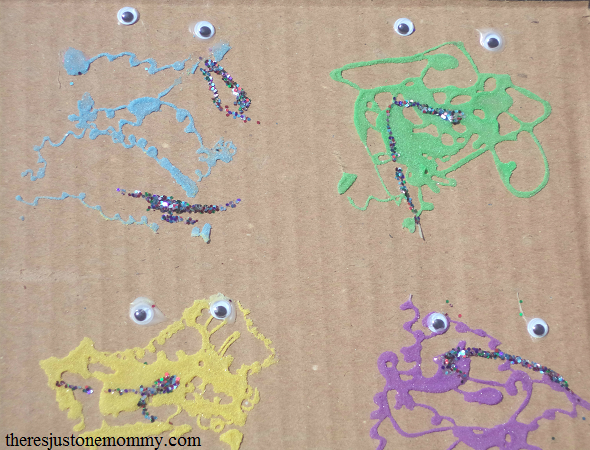 You could also decorate the cardboard a bit beforehand to give you monsters a background. Want to get even more creative? Get out craft feathers, beads, or even pipe cleaners to add to the monsters! Not only do the squiggle monsters turn out super cute, but squeezing that glue bottle also helps strengthen those hand muscles. There’s something about glue that makes it so much fun for kids to squeeze out, lol! Great idea put sand in the bottle so she can squeeze all she wants without a gooey mess! What a fun activity and a cute decoration for Halloween! My boys will love making these Squiggle Monsters. I found your post on the #ToddlerFunFriday Link Up. Squiggle Monsters have become a big hit here — they may just take over the doors! There’s something about that sand, my kids just love it. Thanks for posting. Hello from Family Fun Friday. Thank you for linking up at #made4kids! These monsters look like a lot of fun to make. My kids love anything with sand. They would have a blast making these. What an adorable idea! I will have to try this with my daughter! Thanks for sharing on Toddler Fun Friday!! Thank you. It has been one of my daughter’s favorites.